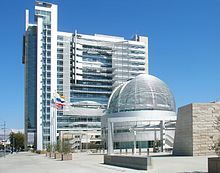 The San Jose City Council, officially San José City Council, is the legislature of the Government of the City of San Jose. In the 2016 elections, Sergio Jimenez in District 2, Devora (Dev) Davis in District 6, and Sylvia Arenas in District 8 have been elected to their first terms, replacing Ash Kalra, Manh Nguyen, and Vice Mayor Rose Herrera. Johnny Khamis in District 10 was reelected for his second term. As the Mayor of San Jose, Sam Liccardo casts the 11th vote on matters before the Council and acts as chair of the Council during most meetings. Magdalena Carrasco serving her first two-year term as Vice Mayor, conducts Council meetings in the absence of the Mayor. District 1: Represented by Chappie Jones and covers West San Jose, San Jose, California. District 2: Represented by Sergio Jimenez and covers South San Jose including the Edenvale (San Jose) area and the Coyote Valley. District 3: Represented by Raul Peralez and covers Downtown San Jose and the San Jose International Airport. District 4: Represented by Lan Diep and covers North San Jose including Berryessa, San Jose, California and Alviso, San Jose, California. District 5: Represented by Magdalena Carrasco which is East San Jose and includes Alum Rock, California and King and Story. District 6: Represented by Devora (Dev) Davis and covers west of Downtown and is made up of the various neighborhoods including greater Willow Glen, San Jose, California; Shasta Hanchett Park, San Jose; The Alameda (San Jose); College Park station (Caltrain); and Rose Garden, San Jose, California. Within the council district are also the commercial strips such as West San Carlos, San Jose in Midtown San Jose, and Lincoln Avenue in downtown Willow Glen; the Rosicrucian Egyptian Museum in Naglee Park, San Jose; the Billy DeFrank Lesbian, Gay, Bisexual and Transgender Community Center on The Alameda near San Jose Diridon station; and the major shopping centers at Santana Row and Westfield Valley Fair (near Interstate 8880, and Winchester and Stevens Creek Boulevards). District 7: Represented by Maya Esparza and covers South of Downtown San Jose from 280 to Capital Expressway, including the Oak Hill Cemetery and Memorial Park; Kelley Park and Happy Hollow Zoo; and the Coyote Creek/Los Lagos Golf Course area. District 8: Represented by Sylvia Arenas and covers Evergreen, San Jose, California. District 9: Represented by Pam Foley and covers southern Willow Glen, San Jose, California to northern Almaden, and the Cambrian Area. District 10: Represented by Johnny Khamis and covers the greater Almaden Valley, San Jose, California and much of the southwest of San Jose. See Ballotpedia article on the 2014 San Jose City Council elections. In the 2012 elections, Ash Kalra, Kansen Chu, Pierluigi Oliverio, and Rose Herrera were elected to their second terms on the council, while Johnny Khamis won his first term, replacing termed-out Councimember Nancy Pyle. In 2010, Mayor Chuck Reed was elected to his second term with more than three quarters of the vote in June. Pete Constant, Sam Liccardo, and Madison Nguyen were elected to their second terms, while Xavier Campos and Donald Rocha filled the vacancies of the termed-out Nora Campos and Judy Chirco. Kansen Chu defeated Hon Lien in the Special Election to fill the vacancy created by the elevation of Chuck Reed from Councilmember to Mayor. Pierluigi Oliverio defeated Steve Tedesco in District 6. Yeager resigned for County Supervisor. In the 2006 Elections, Chuck Reed defeated Cindy Chavez in the Mayor's race. Pete Constant, Sam Liccardo, were each elected to their first terms, replacing Linda LeZotte, Cindy Chavez. This page was last edited on 27 February 2019, at 21:13 (UTC).